BURIAL SHRINE stands in complete defiance of a world which continuously strives to break one's Will. Strength is found in adversity. The BURIAL SHRINE is now erected as a monument to the death of the self, and the realization of the depth and unity of spirit. Ever deeper, to reach ever greater heights. BURIAL SHRINE was formed in Vancouver, Canada, in early 2014 by EH, CXM and RW, with the intention of creating raw and ferocious Black Metal. By the spring, four songs intended for a demo were fleshed out. Work on the demo was begun not long thereafter, but it was ultimately abandoned. The following years were spent largely in solitude - reworking and rewriting the material, discarding riffs, culling songs, abandoning entire concepts, and allowing their vision to crystallize. Finally, during the spring and summer of 2017, new material was written and the remaining old songs were developed to their final iterations. This occurred during a dark process of mortification from which emerged an unflinching resolve to manifest and release the engulfing darkness, thus completing the framework of the project. This terrible intensity continued and permeated the recording process, which lasted from the winter of 2017 into the spring of 2018. During the recording, a host of guest and session members were called upon to add further dimensions to the songs. Bass was provided by CM (Spell, Reversed), while lead guitars were laid down by TS (Ahna, Starvation). The title track features violin provided by Terence O'Shea (Griefwalker), as well as a solo written and performed by MT (Paths, Teeth of the Wolf). This track also features lyrics written by Johannes Nefastos. The artwork for the album was conjured by Casper Macabre. 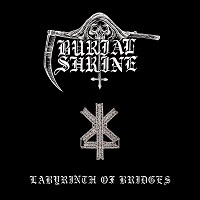 BURIAL SHRINE is now proud to release their debut album "Labyrinth of Bridges" under the banner of Saturnal Records. Hail Sathanas! Hail Death! Speed and aggression are not lot at all in “To Glimpse The Absolute”, carrying on from exactly where the previous song left, this works well to hold the album together, not blending too many styles into the songs overall allows the progression of the album. There are more deathgrowls used here, they don’t hold on for long, but with the raw power it advances the song, the general beat and tempo remain the same from the previous song. “To Give Answer (Vincit Qui Se Vincit)” kicks the trash-attack right into gear, which is a welcomed experimental idea. Vocally, its more distorted, which is unusual for the clean cutting guitar rifs. The general play of the album is clear here, not changing too much, but lighting the sparks with more technical guitar. “To Scorch The Earth” is the trademark sounds to start off the song, with the heavy hitting drums more noticeable here. The general sense of the song is the same as most before, but because the sound is good, it doesn’t feel too repetitive. The drums really help here to allow a new depth to the songs, finishing with a flurry. The drums make the song sound so much different to the rest just from the intensity.